The city of San Diego has a wealth of services available to the gay and lesbian community, if you know where to look. In addition to offering therapy services to the LGBT community, Estes Therapy is happy to share some of the other resources in our city. All of the organizations below offer help to the San Diego LGBT community, from wedding planning to finding a place of worship. The Center (San Diego): The Center provides support to all areas of LGBT issues. 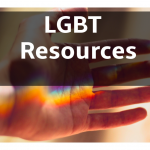 You can find support and resources empowering the LGBT community. OUT Engagement: San Diego therapist Jennine Estes is the co-founder of OUT Engagement, a resource site for engaged gay and lesbian couples who want to build a healthy relationship. San Diego Gay and Lesbian News: SDGLN News includes up-to-date information on all areas of gay, lesbian, bisexual, and transgender issues. GayWeddings.com: This gay and lesbian wedding site has all the resources you need to plan your wedding. Gay Friendly Churches: This article provides a list of gay-friendly churches for most every religion. Greater San Diego Business Association (GSDBA): The San Diego Gay and Lesbian Chamber of Commerce helps you find a business that is supportive of the LGBT community. Human Rights Campaign (HRC): The Human Rights Campaign advocates on behalf of LGBT Americans fighting for equality. UC San Diego Lesbian Gay Bisexual Transgender Resource Center: The UCSD LGBT Resource Center provides a place for members of the LGBT community on campus. Resources include scholarship and study abroad information, and details about living on campus. North County LGBTQ Resource Center: This non-profit organization offers resources that include a directory of businesses that are friendly to the LGBT community, and mental health services. San Diego LGBT Pride: San Diego Pride is annual event celebrating the LGBT community. Gay Relationships in the Raw: This is a blog by me, your San Diego Therapist Jennine Estes. I cover issues that come up in LGBT relationships. Looking for a gay-friendly counselor? Here’s an article that can help.